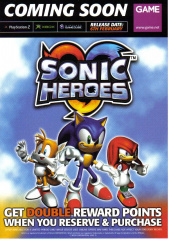 The following are a list of advertisements used during the promotion of the multiplatform game Sonic Heroes. A U.S. developed campaign, contrasting "old" superheroes with Sonic the Hedgehog. A clean version without game screenshots. 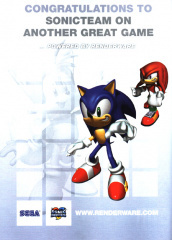 A PlayStation 2-specific advertisement for Sonic's first game on the system. 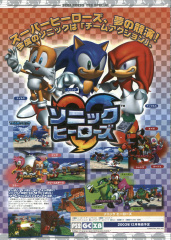 The add gives the members of Team Sonic one-off nicknames, Sonic, Tails and Knuckles being called "The guv'nor," "The Chopper" and "The Enforcer" respectively. 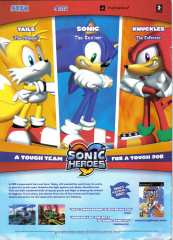 An advertisement showcasing the models of the main heroes of the game, with a stip of screenshots at the bottom. Similar to the above advertisement, but with a five dollar coupon if you purchase the game at the retailer Sears. 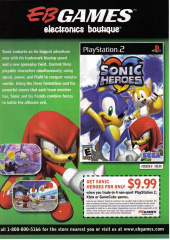 An advertisement for Sonic Heroes with a trade-in tie-in offer through the game retailer EB Games. An advertisement for a playable demo of Sonic Heroes if you put down a deposit at U.K. game retailer Game. A congratulations to Sonic Team from Renderware on another great game. Commercials - A collection of televised advertisements for the game.